About the book: He needs a promotion. She needs to stay in the country. Illegally Wedded is book 7 in the Legally in Love Collection by clean romantic comedy author Jennifer Griffith. Great fun for fans of Cami Checketts and Jennifer Peel. 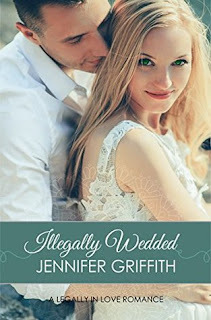 My review: I LOVE Jennifer Griffith's books! They're so well written and so much fun! I love the romance aspect, she really does a great job with it. This one was no different, I loved every bit of it! Zach is such a great character in this one. I love the opening scene in Du Jour with Kinsey. She acts like a boor and he is so annoyed at not being able to eat his lunch that he was looking forward to that he gets rid of her on the spot. I love the way you learn more and more about him as the story goes on. The way he cares for his family. The way he's so loyal and works so hard to make everything just right for Piper. The way he falls for her so fast and is just there for her when she needs him most. Piper is one of my favorite characters! I loved the whole idea of Du Jour, and she was the chef behind it. I didn't like her boyfriend Chad at all though! She definitely needed to get rid of him! I liked the way she was so concerned about any and all laws that she may have unknowingly broken by not being who she thought she was. And I loved the way she was true and loyal to Zach, even though she was thinking she may not stay married to him forever. I love the plot of this one! I love the way Piper and Zach get married. He puts so much more effort into it than she had thought he would. I love the way they fall in love after they're married, slow and sweet. I love all of the little things these two each do for the other. And the ending is just so perfect! Grab this one, it's such a great clean romance!